The Clean Green Lobby Machine painted the Capitol green on Tuesday! What happens when a piece of coal and a wind farmer play tug-of-war? At the feet of the Capitol’s tall granite walls, solar panels and wind turbines challenged Big Coal to a game of tug-o-war. One hundred and eighty clean energy advocates stood on the Capitol’s steps, wearing green and yellow t-shirts or dressed as wind turbine operators. The sun was shining, chants rang in the air and, in the end, clean energy won the battle—sending Big Coal to its dusty grave! 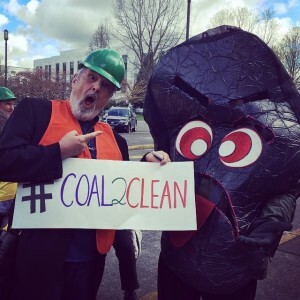 This good-natured scene followed an inspiring address from Treasurer Ted Wheeler on Oregon’s sustainable investments at this week’s Lobby Day for the Environment: The Clean Green Lobby Machine. Organized together with the Oregon Conservation Network and several partner organizations, the day was a grand success. In fact, Treasurer Wheeler said it was the largest turnout for any lobby he had ever seen! 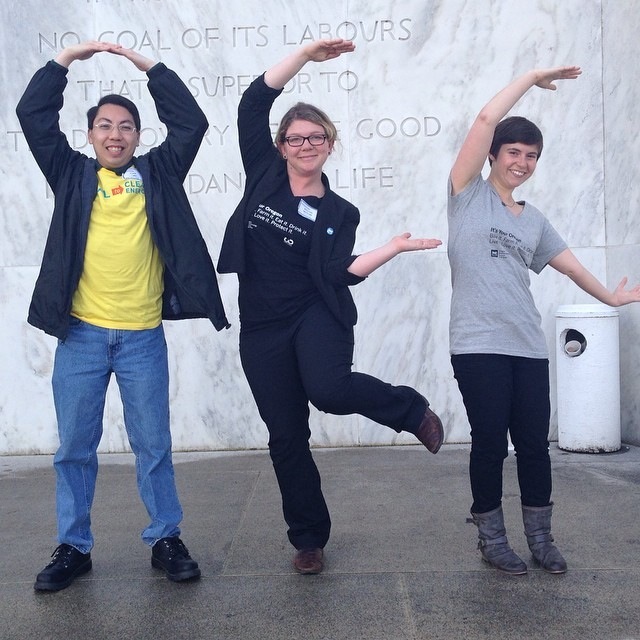 OEC volunteers joined hundreds of other Oregonians, visiting their legislators to discuss smart policies that protect the state we all love. Youth, elders and all ages in between came together in Salem to talk with lawmakers about transitioning to a clean energy economy, supporting Oregon’s transportation system and protecting our communities from toxic chemicals. But don’t take our word for it. Hear from OEC’s incredible volunteers! When asked, will you reach out to your legislators about environmental issues again? The answer was a resounding YES! Join Orly, David and Frank in speaking up for Oregon’s environment and sign up for our action alerts today. Special thanks to: Oregon Conservation Network, Oregon League of Conservation Voters, Sierra Club, Beyond Toxics, Bicycle Transportation Alliance and all the volunteers who worked so hard to pull this event off. OEC was honored to play a small part. 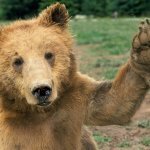 High Fives for Giving Tuesday! Support OEC this #GivingTuesday & Double Your Gift! Kittens. High-fives. Pants. Some things are simply better in pairs, like gifts. 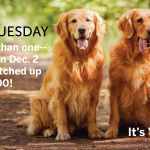 On Dec. 2, when you make a gift to Oregon Environmental Council for #GivingTuesday, your donation will be matched up to $1,000. And if your company has an employer matching program, your gift will be tripled! 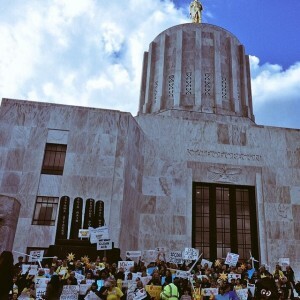 Clean air, clean water and healthy Oregon communities? Now, that’s worth a celebration (or two). So on Tuesday, Dec. 2nd, pledge a gift and have it doubled! No Replies to "The Clean Green Lobby Machine painted the Capitol green on Tuesday!"